Flexiducting New Zealand are leading suppliers of Composite Hose assemblies. 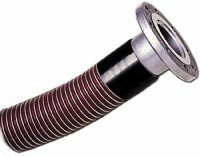 We can provide composite hose with fitted couplings up to 16″ in diameter and to lengths of 30 metres. 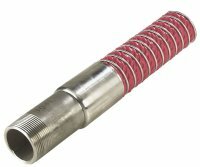 Composite Hoses are a unique hose manufactured using layers of special materials, held together between an inner, and an outer wire. Used to convey chemicals, fuels, oil, hot water, gases and bitumen. For tanker loading and unloading or for transferring there is a composite hose for all applications – from high temperature for hot tar to extra low temperatures for cryogenic requirements. Uni-Oil Composite Hoses are ideal for transfer of media from storage tanks and process piping to rail cars or tank trucks. Composite construction includes multiple plies of polypropylene films and fabrics are encased in a polyester vapour barrier for superior operation. Uni-Zene Composite hoses are a combination of polyamide, polyester and polypropylene film and fabrics. Special service petroleum composite hose is designed to handle modern petrol additives such as MTBE, ethanol and 100% benzene. Uni-Chem Standard Chemical Service is specifically designed for in-plant liquid transfer operations as well as tank truck delivery and rail car loading. These hoses offer supreme flexibility in comparison to rubber hoses. Constructed with multiple plies of polypropylene films and polyester vapour barrier, these hoses can be operated at positive pressure or full suction. A Composite Vapour Recovery Hose assemblies are ideal for use in petroleum and petrochemical vapour recovery systems in ship-to-shore, bottom loading and tanker loading and unloading applications. From Flexiducting we can supply the Uni-Oil Aviation Fuel Hose, a lightweight Composite Hose with an aluminium inner wire specifically designed for transferring aviation fuels. Hose meets BS3492:1987 BX and Class 1 for aviation fuels. Nova BioFuel 100. A rubber or composite hose designed to handle all grades of Biodiesel and Ethanol. Available as a rubber or a composite hose this biodiesel hose is a flexible, full suction and discharge hose for in plant applications or for loading rail tankers and trucks. The Flexiducting NZ Composite LPG Hose and hose assemblies are specifically designed for transfer of LPG (Liquefied Petroleum Gases), manufactured using a stainless steel 316 inner and outer wire it is suitable for tanker loading and unloading, in-plant operations, marine offshore and ship to shore applications. APPLICATIONS: Light weight, flexible hose designed for suction and delivery of petroleum based products. Suitable for road and rail tankers. Internal Wire – galvanised steel. External wire – galvanised steel. Green with a yellow stripe. APPLICATIONS: Super light weight hose for suction and delivery of petroleum based products where ease of handling is paramount. Internal wire – aluminium. External wire – galvanised steel. Yellow with green stripe. APPLICATIONS: Specially designed for the suction and delivery of aviation fuel. Internal Wire – Stainless steel. External wire – Black polypropylene coated galvanised wire. Black with green stripe. APPLICATIONS: Suitable for the collection or transfer of hydrocarbon vapours within the oil industry. Internal Wire – Galvanised Steel. External Wire – Galvanised Steel. Complies With AS2683. Black with yellow stripe. Manufactured from polyester film and fabric designed for high temperature operation, this hose is ideal for the transfer of hot bitumen via gravity, suction or pressure. This hose is suitable for use with bitumen up to 180˚C”. It is ideally suited for road tanker loading and discharge, in Plant transfer, spraying and spray bar applications. 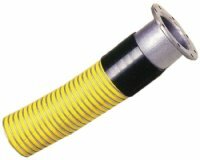 This hose is also suitable for conveying high aromatic content fuels. Internal Wire- Galvanised Steel External wire – Stainless Steel. White.